This potluck pleaser is best served promptly, but the sauce can be made hours ahead and reheated as the pasta is cooking. In the top of a double boiler (or a large bowl set over a simmering pot of water), combine cream cheese and butter. Heat to melt, stirring occasionally. Add garlic and whisk mixture until blended. Whisk in evaporated milk, pepper, and salt until blended. Stir in 1/2 cup Parmigiano cheese and set aside. Cook fettuccine in salted water according to package directions. During the last two minutes of cooking, add peas to boiling pasta water in pot. Drain fettuccine and peas; toss with reserved sauce. Add half the salmon and pecans, mixing gently. 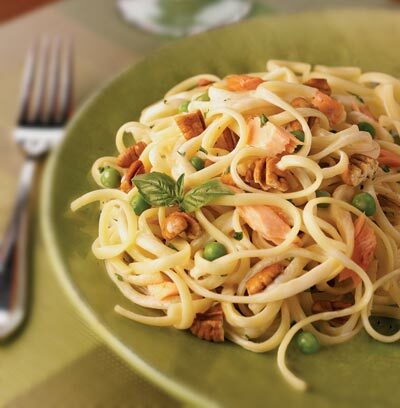 Serve immediately, topping each portion with a sprinkling of remaining salmon and pecans. For a special touch, add a generous sprinkling of chopped parsley when serving this dish to brighten the rich taste of pecans and smoked salmon.